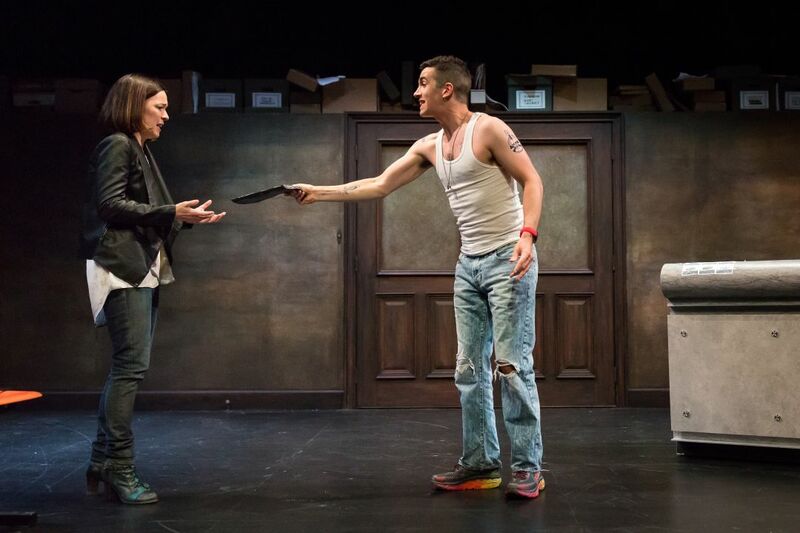 Todd Waite as Nikolai, Jeffrey Bean as Isaac, and Liv Rooth as Yevgenia in Alley Theatre’s World Premiere of Describe the Night by Rajiv Joseph. 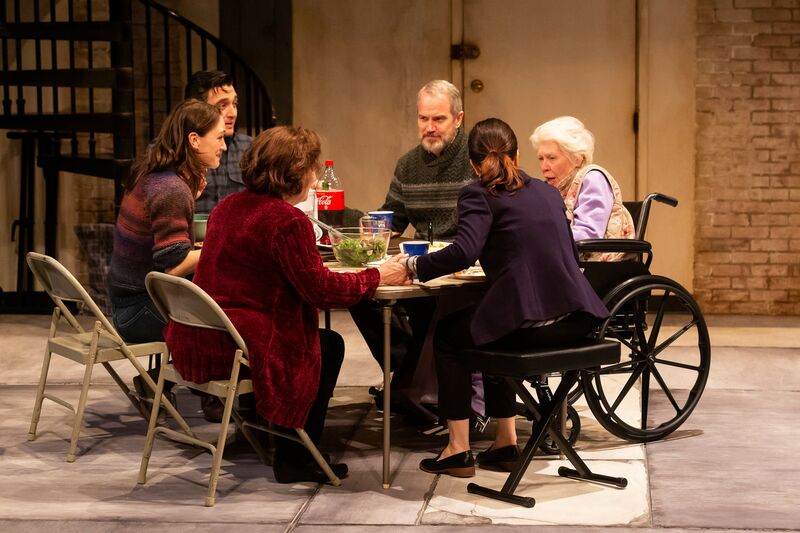 Although the Alley Theatre sustained substantial damage from Hurricane Harvey, their world premiere of Rajiv Joseph’s Describe the Night goes on at UH’s Quintero Theatre. This Alley commission covers a lot of territory both geographically and historically, juxtaposing the high drama of proto-Soviet Russia in 1920 with the conspiracy-laced 2010 Smolensk place crash, which killed many high level Polish government officials, including the president. 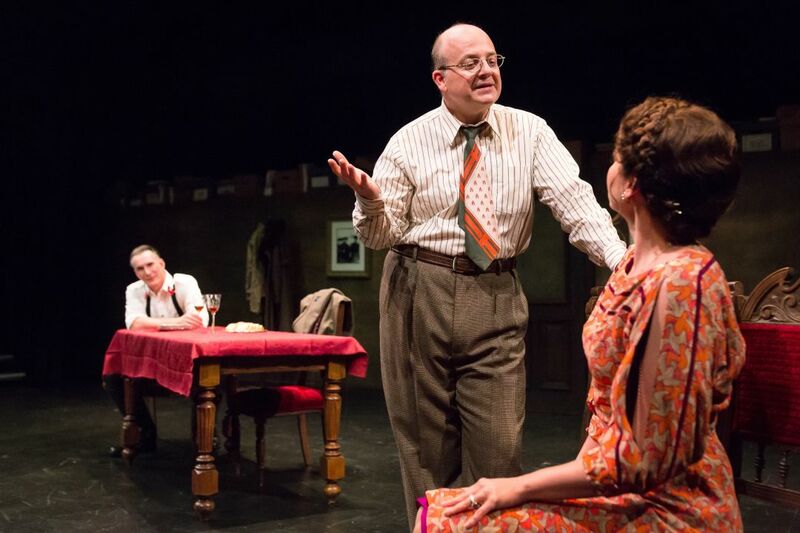 In three acts, the play follows the diary of Isaac Babel, the Russian author played by Alley favorite Jeffrey Bean. At the outset, Babel narrates his frustrations with literary art and “describing the night,” and the audience is immediately taken by the minimalist set, the poignant and stirring music, and the force of Babel’s personality. His diary serves as the objective record of his own tumultuous life, changing hands through the decades depending on the cruel vicissitudes of wars—both political and personal. Some of the dialogue feels lengthy and meandering, with long gaps before realizing its significance, but I consistently loved the period costume designs of Amy Clark, the scenic design of Tim Mackabee, and the excellent original music and sound design of Daniel Kluger. There were even crickets chirping in a forest at one time—an example of the attention to detail. 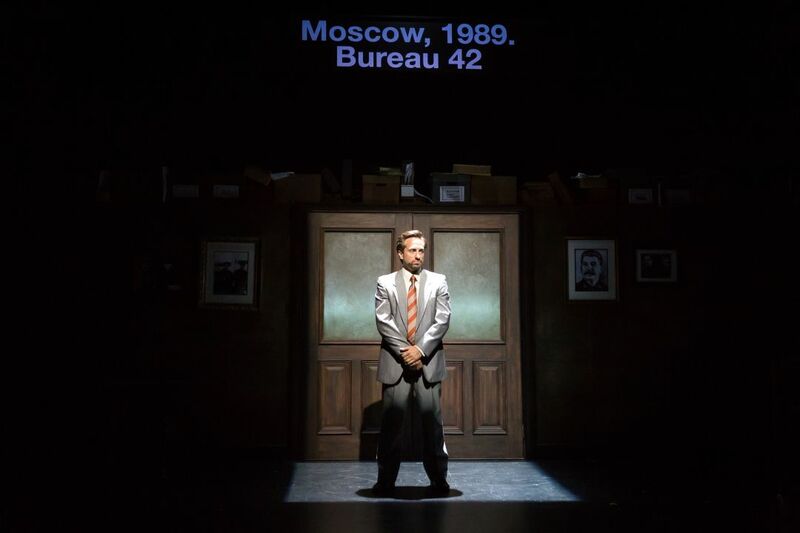 Jason Babinsky as Vova in Alley Theatre’s World Premiere of Describe the Night by Rajiv Joseph. Even those familiar with the work of Isaac Babel might not know about his unhappy marriage to a wife who lived in Paris, his affair with the wife of his friend Nikolai, and the personal and political consequences of being an artist in an oppressive and dangerous political environment. Joseph’s play humanizes Babel, reminding us that even the most brilliant of minds cannot escape political reality. 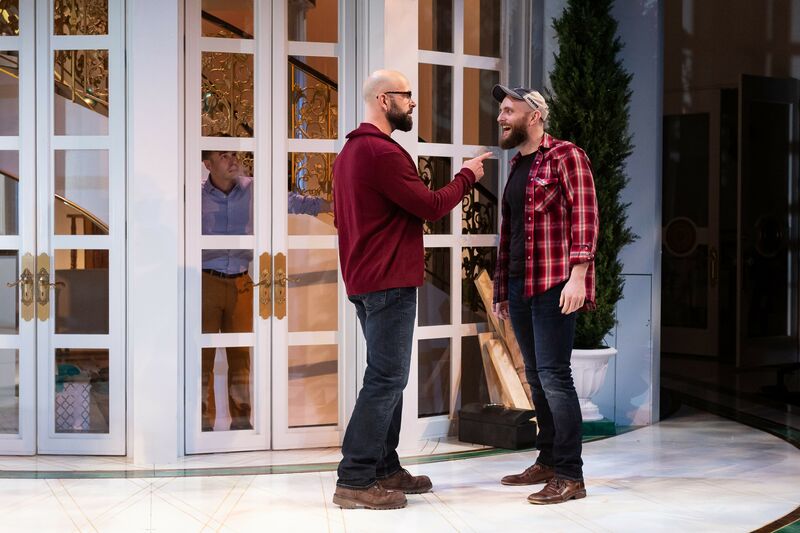 The play has much to say about truth and its slipperiness, especially when it can be overridden by political and military force. Babel says, “I am the worst person to determine what was true,” and that proves tragically visionary since he cannot survive the political imperatives of his time. His friend Nikolai, played by the excellent Todd Waite, is caught between personal loyalties and his authority as an arm of the Russian government. “True is what happens,” Nikolai says. “False is what does not happen”—ominous foreshadowing of the erasure of those who fail to adhere to the rules of Russian society. Elizabeth Bunch as Mariya and Stephen Stocking as Feliks in Alley Theatre’s World Premiere of Describe the Night by Rajiv Joseph. The whole notion of “subversive” is, well, subverted, as Joseph reels out the ironies of political rhetoric that aims to elevate the state, but simultaneously rids the state of its most creative minds through brutal and relentless force. The helplessness of characters under the thumb of communist authority is palpable, and the audience can begin to imagine the suffering of the people during the majority of the 20th century through the present. This is a strong ensemble cast who handles challenging dialogue that in other hands might seem tedious and predictable. 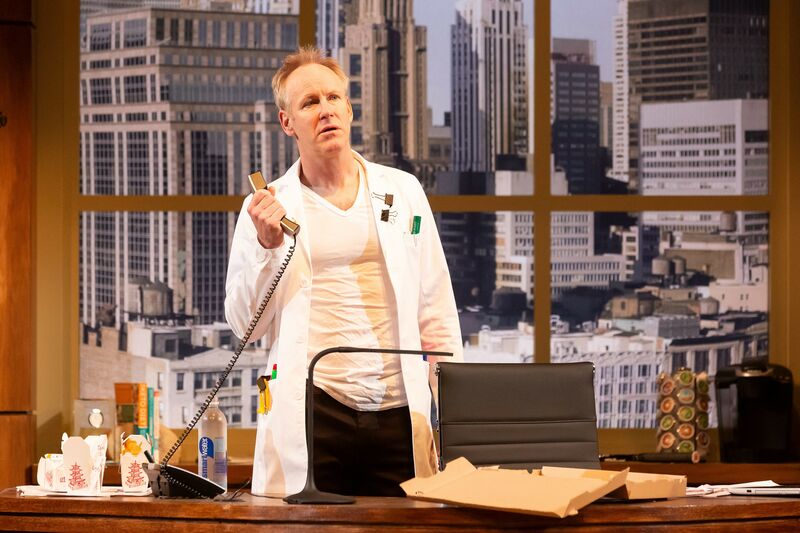 Just when you think you can’t stand another “truth versus reality” themed work, these actors are able to revive that theme in interesting ways. The idea that telling fictional stories is not the same as lying is not original, but set in the high-stakes context of world wars and KGB intimidation, it becomes more interesting, more believable as a presence. Babel says, “Am I a liar? No, I tell stories.” But in some instances, he is a liar, and in others, his stories do indeed reveal important truths. Some of my favorite performances were from Alley veterans Elizabeth Bunch as Mariya, a journalist caught at the wrong place at the wrong time, and Melissa Pritchett as Urzula, the granddaughter of Isaac Babel who longs to escape from East Germany to freedom. 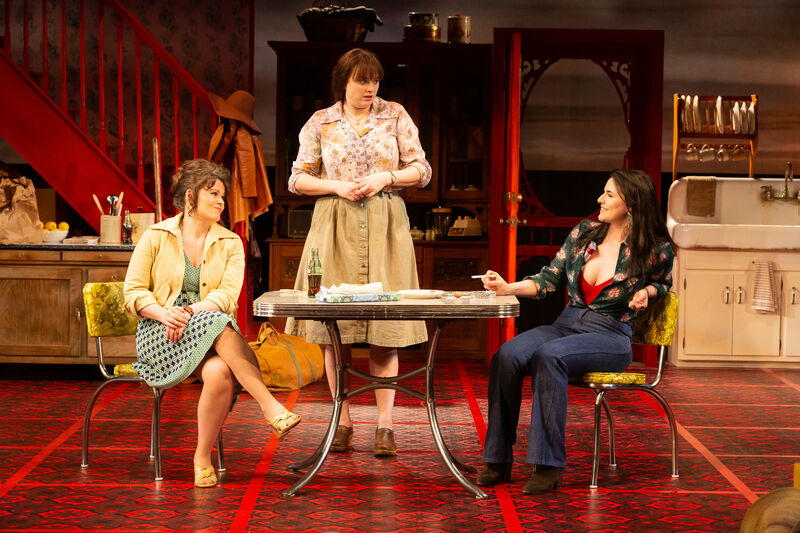 I was also impressed by the Alley debut of Liv Rooth as Yevgenia, who ages over the decades as a reminder that shifts of history often have irreversible consequences. It’s those consequences that underscore the high personal and historical prices for communism and its reach into the 21st century, and Describe the Night forces us to confront the darkest historical times and the artistry that translates those times into both fiction and fact. Describe the Night. Thru Oct. 15. Tickets from $55. UH Quintero Theatre, 3351 Cullen Blvd. 713-220-5700. Tickets available here.